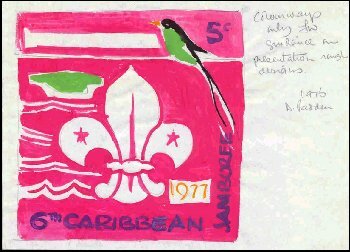 This is the complete set of the artists first color sketches drawn in 1976 for a Scout stamp set. 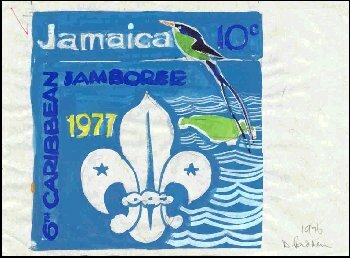 This issue by Jamaica commemorated the 6th Caribbean Jamboree. All sketches are hand signed by the artist in the margin. 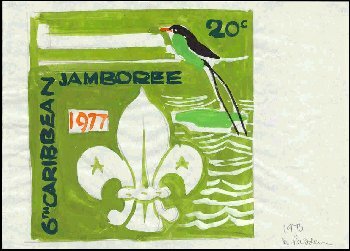 The stamps were issued on August 5, 1977 (Scott #427/30). Each issued value is displayed next to the original design. 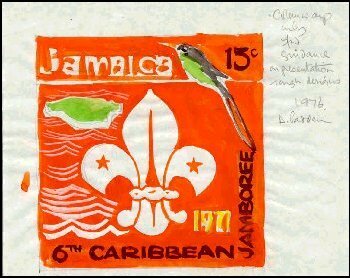 The Doctor bird shown on these stamps is the National Scout Emblem of Jamaica. The stamps were printed by the House of Questa.